Neil Young takes aim at Apple with hi-res music service | What Hi-Fi? Neil Young plans to launch a hi-res downloads service called Pono alongside a range of portable music players in order to "save the sound of music". Young's Pono project has the backing of Sony Music, Universal Music Group and Warner Music Group according to Young's investment partner Craig Kallman, chairman and chief executive of Atlantic Records, reports Rolling Stone. In a book due out next week, Waging Heavy Peace, Neil Young talks of his efforts to convince Apple to take up the mantle and offer higher resolution music, talking of emails and phone calls on the subject with the late Steve Jobs. MORE: Linn MD says Pono is "misguided" and destined for "ridicule and failure"
Now going it alone, Young hopes that his Pono music service "will force iTunes to be better and to improve quality at a faster rate". 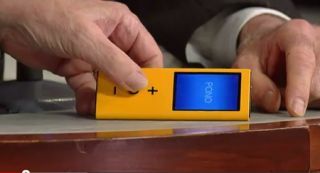 Neil Young showed-off a prototype Pono music player on The Letterman Show in the US, reports The Verge, with a chunky design and yellow finish. You can watch the show on YouTube here. Other music artists are said to have been demoed the Pono music and player and been impressed by the difference. Flea, from the Red Hot Chilli Peppers, told Rolling Stone, "It's not like some vague thing you need dogs' ears to hear. It's a drastic difference."